We had dinner with some good friends and colleagues and went to the Hotel del Coronado. They have a nice restaurant there headed by Meredith Manee. The menu was quite nice, and the thing that I liked about it was the fact that there was a tasting option. This one being choose one from each category – a first, second and main along with a dessert. 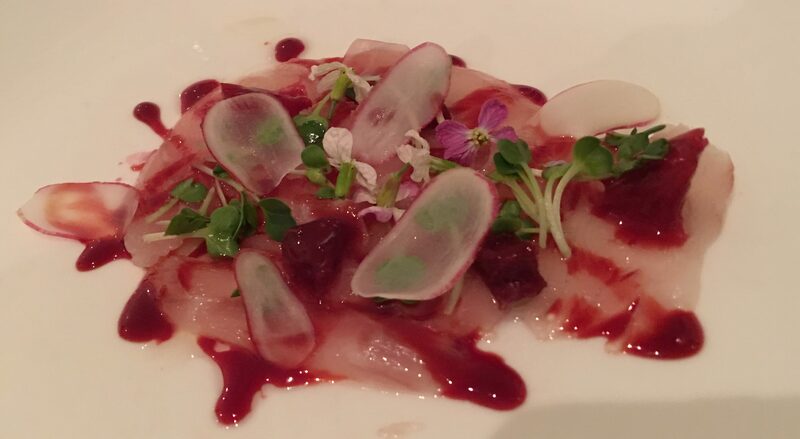 I started with the Baja Striped Bass Crudo. Along with Heirloom Radish, Blood Orange, Ginger Oil, Radish Sprouts and Blossoms, it looked fantastic when presented. The fish was cured perfectly and the hints of everything together was just absolutely amazing. The Blood Orange made the perfect acid side to the Crudo to cook and flavor it. Pleasantly surprised, it was time for the second. I went for the Dungeness Crab Tonnarelli with Roasted Bell Peppers, Scallions and Yellow Thai Coconut Curry. My goodness. What an amazing dish. The Crab, tender. 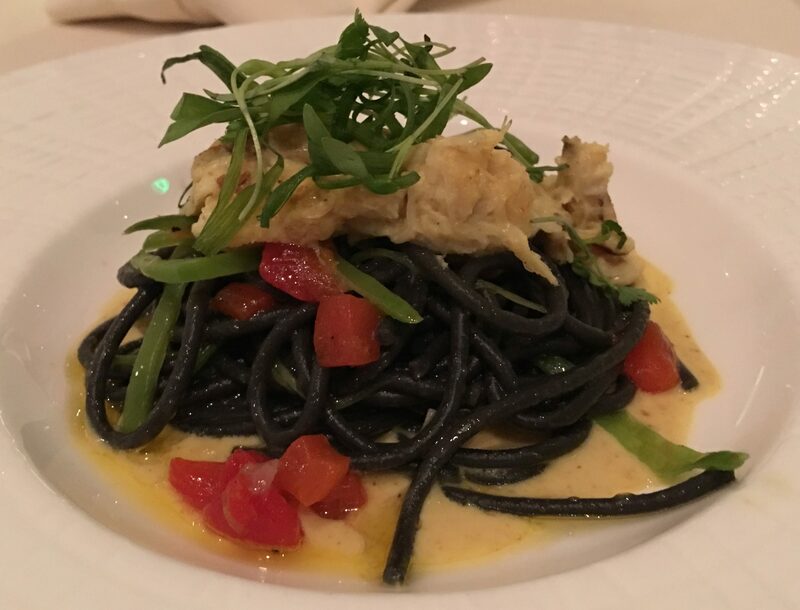 The Squid Ink Tonnarelli was not too squid-inky, which a lot of places have a problem with. And the Curry, wow, more Laksa-y than Thai, but still making it an amazing dish. Then it was on to the Main, where I went for the Surf and Turf. 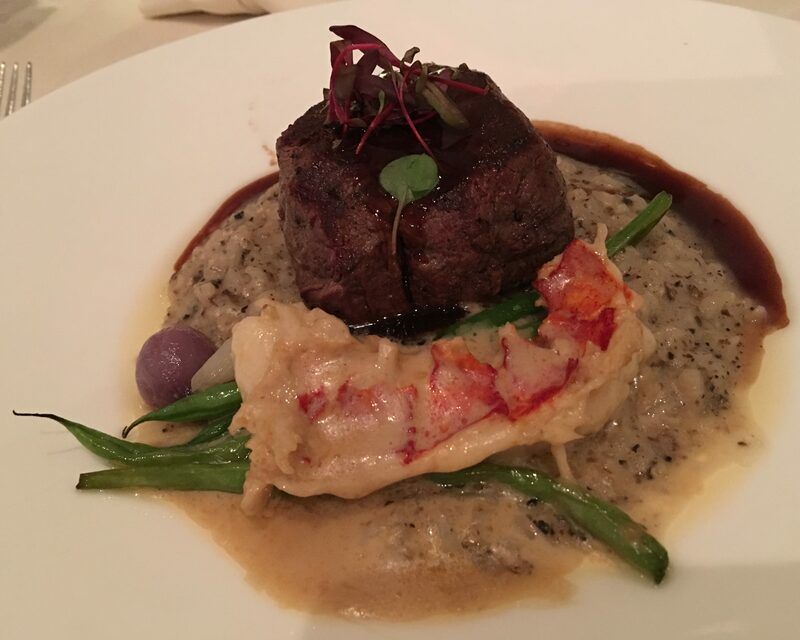 A Filet with a Lobster Tail, Truffle Risotto, Haricot Vert and Pearl Onions. So perfect. Filet done to a perfect medium rare. Lobster tail poached to perfection. Truffle Risotto not too heavy on the truffle. Melt in your mouth goodness. With the meal the way it was, how could you not go for dessert? 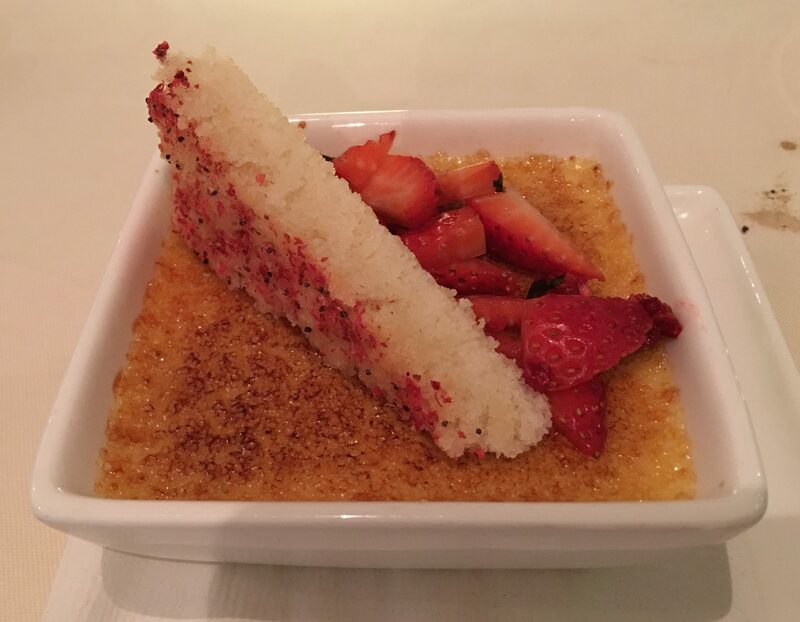 And my dessert that I chose was Pink Guava and Strawberry Creme Brulee. Pink Guava Puree inside the Creme Brulee, a strawberry salad and some slices of Almond Cake on the top. Wow. Perfect blend of sweet and sour, sticky and sweet. Loved it. What an amazing meal. The price was only $85 USD for the set meal! Can you believe that pricing? Come here. Bring a loved one and make it a romantic meal, you’ll be a hero. Posted in Beef, Cake, Crab, Fine Dining, Lobster, Pasta, San Diego, SteakTagged Crab, Fine Dining, Fish, Lobster, Pasta, San Diego, SteakBookmark the permalink.